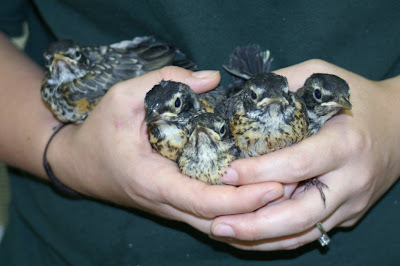 Storms have been riping through the Wisconsin landscape taking with them many nests of late nesting passerines such as the American Robin, Eastern Bluebird, Mourning Dove and Cedar Waxwing. As a result the REGI passerine section is filled with cheeping and peeping little tykes. Some of the babies have feathers but some are newly hatched and naked. Young passerines grow rapidly. 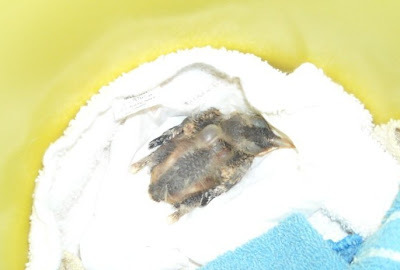 Some species can go from hatch to flight in only 8-10days! Can you even imagine that? Of course when they are raised at REGI that time span is longer. While the diet we feed youngsters is very good in terms of having all the elements needed for their growth and development, we can never be a perfect as their own parents. As a result they grow a bit more slowly. 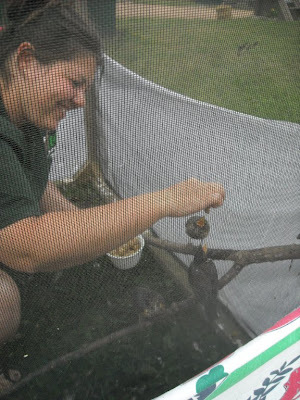 After they are grown we have to make sure they know how to secure food and interact with other birds they will encounter in their life once released to the wild. The good news is our passerine flights have a wide variety of species most of the time, often including adults of the same species as the youngsters. It was a busy weekend for programs. 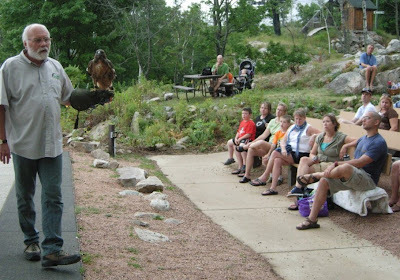 ON Saturday we gave three programs, two at the REGI site and one at Rib Mountain in Wausau. I will include some photos below of the Rib Mountain event. You can see from the photos how beautiful Rib Mountain State Park is. The Rib Mountain event is held yearly and put on by the Friends of Rib Mountain. They are a terrific conservation group. It rained during the presentation. 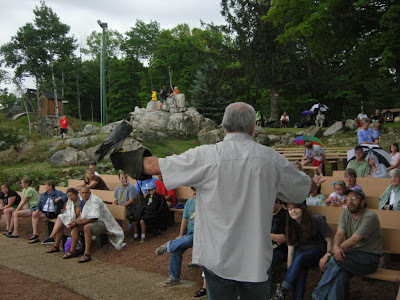 Super educator Steve Fisher continued on even with the rain. His mantra is that as long as the audience was willing to stay he is. Now THAT is dedication. :) There were about one hundred folks the braved the rain with him. Off to feed those little passerine babes.